First, the results of some googling. Choi sum (Brassica parachinensis) is a member of the Mustard family is also referred to as a flowering pak choy. Chee hou sauce is similar to hoisin sauce but spicier. 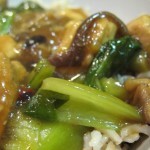 The meal also contains oyster sauce, vinegar sauce and chilli [sic] sauce. 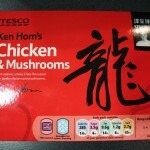 This is actually one of my favorite Tesco meals. I don’t know if the taste is greater than the sum of its sauces but it is tasty–slightly sweet and earthy, but despite the chee hou and chilli sauces not spicy at all. The chicken is tender and plentiful and the various mushrooms (shiitake, button and tree ear) provide a lot of nice textures. The choi sum can be a bit woody, though. It’s quite healthy but high in salt. I usually serve it over Tilda steamed brown basmati rice.